I've always wanted to do a bacalao dish for the longest time. Of course, given that I'm also the type extremely comfortable with desires percolating somewhere in the back of my mind, I've never actually done anything concrete to realize my bacalao dreams. One day, however, some bacalao just happened to fall into our shopping baskets when we were out shopping for mascarpone cheese. A bacalao dish is simply needed to complete a Spanish-themed menu, don't you think? So, that's what we did for our Spanish-themed New Year's Eve Party. I vaguely remembered a bacalao dish with potatoes from a show long time ago, so I suggested that we do something similar with our bacalao. So, it was off to consult 1080 Recipes yet again! 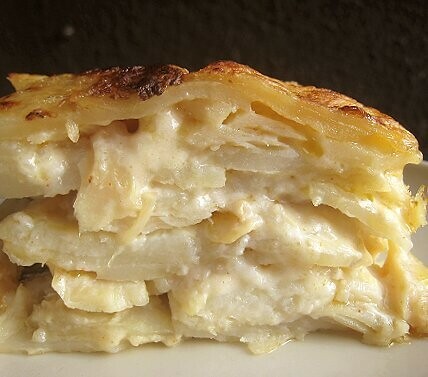 Of course, we also looked to Núria's blog for bacalao information. 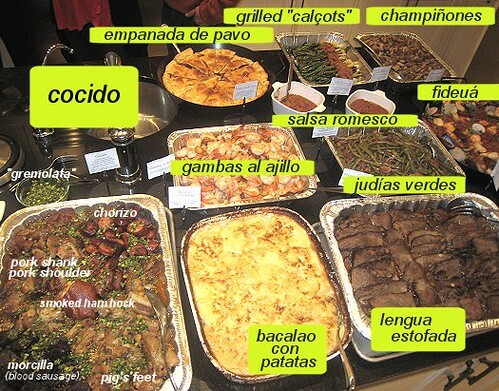 She even has a bacalao and potato dish as well! Before anything else, I had to get the bacalao soaking. I soaked them in cold water for two days, changing the water several times. So, what bacalao dish to make? JS and I were very intrigued by Bacalao al Pil Pil, a dish where the cod's own fat/oil is used to make an emulsified sauce (Núria has posted about it before). But, as our codfish didn't have the skin on, we couldn't make that. Besides, it was probably going to be challenging making enough for 50+ people. I ended up pulling a Frankenstein with my dish, pulling ideas from a couple of recipes from the cookbook to make my own version of Bacalao con Patatas. It was very easy to cook the fish. After the two-day soak, I rinsed them off. Into a pot they went, and then some water to cover. I turned the heat to high, and when the water was starting to boil, I turned the heat off. The pot was covered and the lot was left to sit for about 10 to 15 minutes, even up to 30 minutes. Then, it was time to take the cod out of the cooking water and flake it! I sliced some russet potatoes thinly, using the food processor. Perfectly sliced potatoes are not required here. I must say we had quite a bit of scraggly bits of potatoes. The creamy sauce was simply a béchamel. I started by heating a combination of milk and cream in a pot and steeping some garlic cloves, black peppercorns and a couple of dried bay leaves in it. In another pot, I made a roux -- heating some butter in a pot, then adding an equal amount of flour -- and whisking and cooking that for a few minutes. The steeped milk went in next. The mixture thickened quite quickly. I seasoned the sauce with a little bit of smoked paprika, and refrained from salt (as the bacalao was still quite salty). There's my little bacalao con patatas set-up. 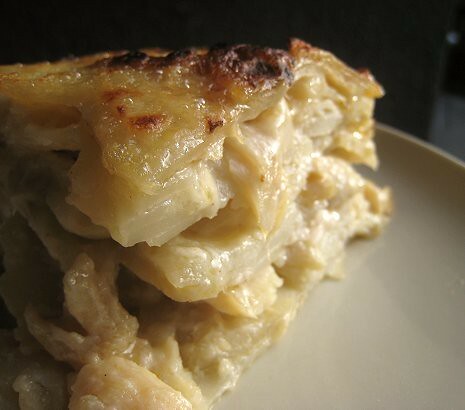 I layered the baking dish with béchamel sauce, then sliced potatoes, then flaked bacalao, then more sauce. I repeated until I reached the top, making the sauce the final layer. I covered the dish with aluminum foil and baked in a 350F to 400F oven for about an hour. For the final few minutes, I took off the foil and broiled the top for a nice browned look. There it is, out of the oven, all golden and crusty on top, and creamy below. We ran out of oven space so we only made one pan of our bacalao con patatas for the party. (There were enough potatoes and bacalao for two pans.) The dish sold out in the first 20 minutes! I had to scrape the sides of the pan for my own serving. 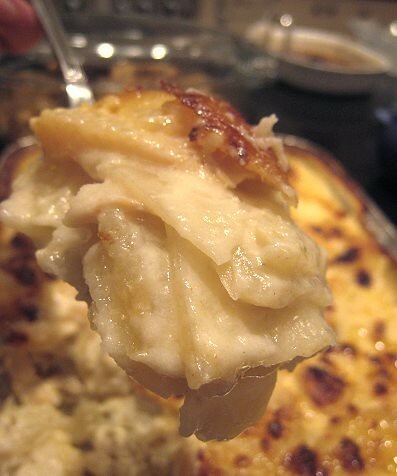 Which was a blessing in disguise, I suppose, because nothing beats the broiled béchamel bits -- they were delicious! The potatoes were soft and tender, the sauce über-creamy, and the salt cod just added some flaky, salty kick to the whole dish. This was such a superstar dish. I don't think I'll be content leaving my bacalao desires on the backburner after this dish. 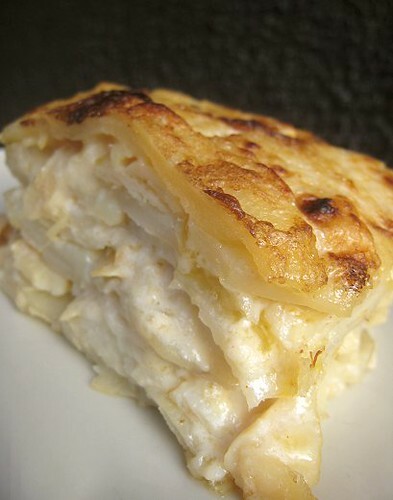 I foresee bacalao con patatas gracing our table many, many times in the near future. This is a very forgiving dish in that measurements/quantities do not need to be exact. 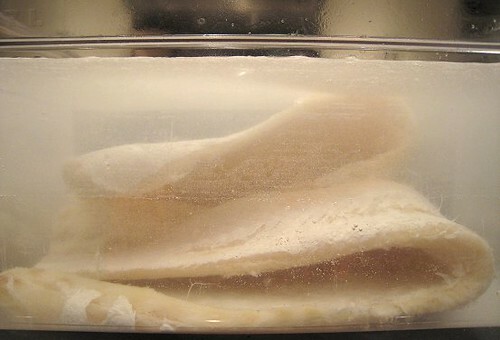 Soak salt cod in cold water for two days, changing the water several times. 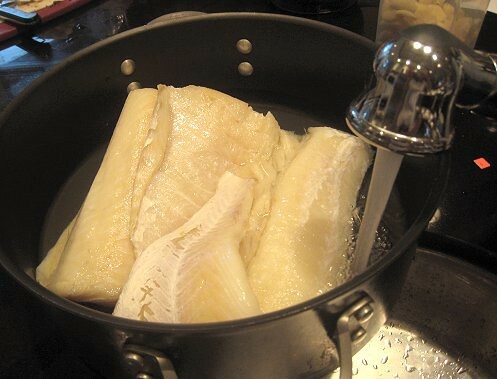 To cook the salt cod, place it in a pot. Cover with cold water. Place over high heat. When the water starts to boil (not yet a rolling boil), turn the heat off and cover the pot. 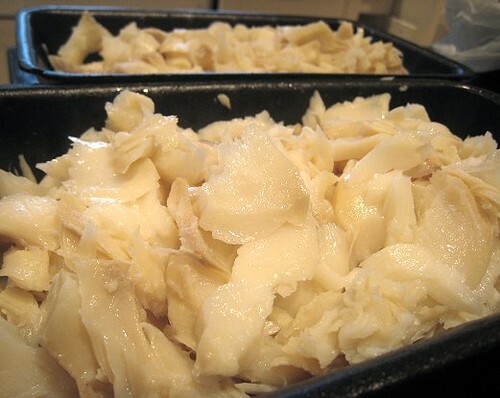 Let salt cod sit in the water for 10 to 15 minutes. Take out of the water and flake. Set aside. In a small saucepan, heat milk and cream over low heat. Add garlic, bay leaves and black peppercorns and steep for about 10 to 20 minutes. Turn off heat and let sit for about 10 more minutes. Remove the garlic, bay leaves and peppercorns; discard. In another pot over medium-low heat, melt the butter. Add the flour and start whisking. Cook this mixture until light golden brown in color, about 2 minutes. Pour in the milk-cream mixture and whisk until smooth and thickened. Season with smoked paprika. 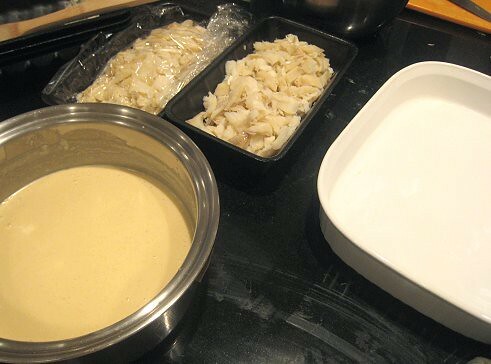 In a baking dish (approximately 9-inch by 13-inch, and 2 or 3 inches in height), add a ladle of sauce, a layer of potatoes, and a layer of salt cod. Repeat until desired height or quantity is reached. End with a final layer of sauce. If you need more sauce, simply add more milk or cream. Cover baking dish with foil and bake for about 45 minutes to 1 hour. To test, poke a knife into the dish; the potatoes should yield easily to the knife. Remove foil and broil the dish until the top is golden brown. Wow!!! Yeah, sure it was a superstar... Magnifico, I'd say! I have to clone your way of cooking it. 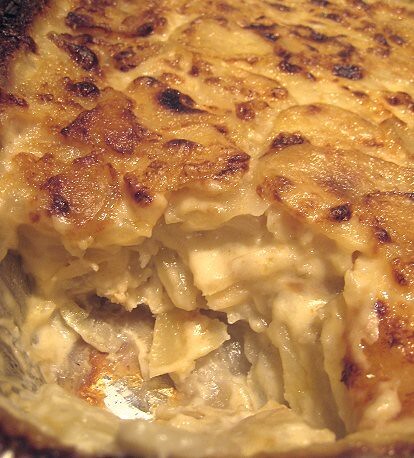 It looks superb and I love the bechamel on top... delicious :D.
Thanks so so much for the mention :D. I love cod fish (bacalao) and can't wait to see the rest of the Spanish menu... Happy New Year... isn't this the best way to start a year? Smuack! Gals, you did a fabulous job. 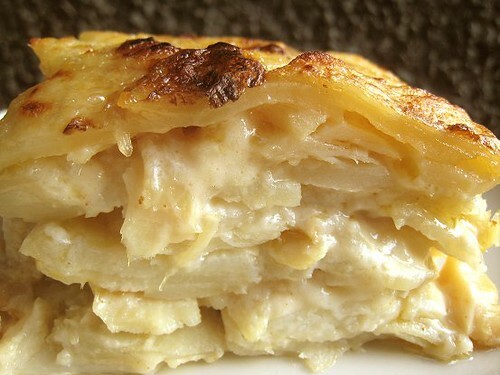 I've had bacalao with potatoes -- but not with a bechamel. This looks really great. I'm going to have to try it. Oh wow, doesn't that look good? 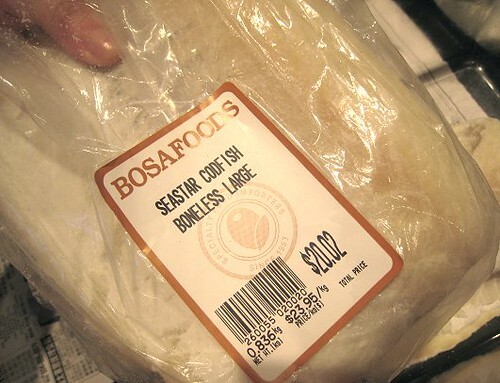 Did you know we have salt cod in groceries in the Philippines? And holy crap it is just as expensive in Canada as it is in Manila! We get excellent salt cod here, I am definitely going to give this a try. i am seriously making this dish THIS weekend. it's supposed to be cold again and this looks like serious comfort food. it just so happens that i have salt cod in the freezer waiting. Thanks!!! =D We would love to see your version. Maybe you can try substituting tuyo for bacalao, hehehe. I guess you can try Italian/Portuguese/Spanish stores in your area. Or even "gourmet" grocery stores?